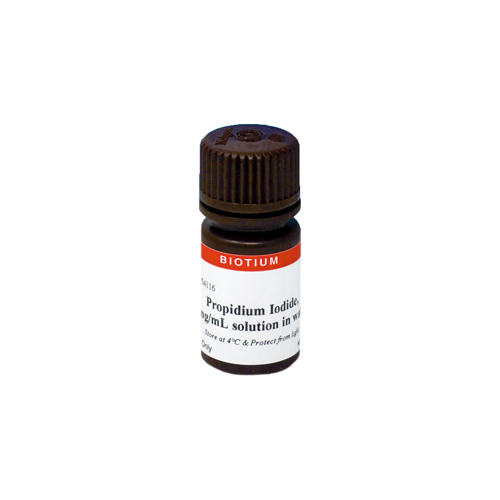 Propidium iodide (PI) is a cell impermeable nucleic acid intercalating dye. Because PI is excluded from viable cells, it can be used to distinguish necrotic or late apoptotic cells with damaged plasma membranes from viable cells or early apoptotic cells with intact cell membranes. After entering cells and binding to DNA and RNA, the fluorescence of PI is enhanced 20- to 30-fold. PI can be used in flow cytometry and fluorescence microscopy. PI is also utilized as a counterstain in multicolor fluorescent imaging, but nuclear-specific staining requires digestion of cellular RNA. PI is dead cell specific in all cell types, including mammalian cells, bacteria and yeast. See our Cellular Stains Table for more information on how our dyes stain various organisms. We offer PI in a variety of formulations and in conjunction with our fluorescently labeled Annexin V.
Ethidium homodimer III and 7-AAD are alternative dead-cell selective stains. Also see our Live-or-Dye™ Fixable Viability Staining Kits.